Todd and Cody approach Josh and Melissa in the park, and Cody can't believe that they've all been sneaking around behind each other's backs. Cody says that she and Todd wanted to tell Josh and Melissa the truth, and Melissa admits that she feels "really stupid". TODD: Well, how about me? CODY: Guys, we're all in the same situation. [to Melissa] You wanna be with Josh, don't you? MELISSA: Yeah, but that's not the point! CODY: And I wanna be with Todd! So what's the problem? JOSH: There is no problem. They all agree that they're happy about the way things have turned out, and vow to stay friends, but Melissa can't resist a joke with Todd: "Tell me, what's Cody got that I haven't got?" Harold arrives home to see Madge sitting on the floor reading a book; she says that she can't wait for their couch to return. Madge tells him that she's had a "fascinating" day, and that they've been invited to Dorothy's for dinner tomorrow night. 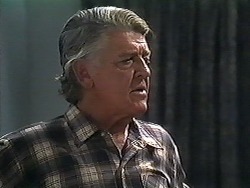 Remembering Dorothy's supposed crush on him, Harold panics and says they can't go because Eddie moves back in tomorrow. Madge says he has a key and can look after himself. MADGE: Besides, I wouldn't miss this dinner with Dorothy and her dad for anything. You should see the sparks fly! HAROLD: Well I think your intentions leave a little to be desired. Madge asks him whether he thinks there's a hint of a romance in the air, and Harold looks worried again. HAROLD: What are you talking about? MADGE: Just that someone around here has sent someone else's heart aflutter. HAROLD: Oh, I'm not sure that I follow. MADGE: Well you'll just have to wait and see till tomorrow night, won't you? Harold says that he's going to put his foot down; they're not going tomorrow night and Madge will just have to cancel. Better luck next time, Harold. It's the next night, and he's sitting down for dinner with Dorothy and Madge. They make some small talk about how business at the Coffee Shop is going, and Dorothy tells him that she loves eating there when she can get away from the school. Harold remarks that Clarrie seems to have taken a shine to Madge, and Dorothy admits that he's an "incurable flirt". Clarrie enters the room with a huge soup bowl, with Rosie the dog at his side. Harold sneezes and starts to explain about his animal allergy, but Clarrie cuts him off, explaining that Rosie thinks she's human and will develop a complex if she hears Harold referring to her as a D-O-G. Dorothy shoos Rosie out of the room. CLARRIE: Old Bossy Breeches always gets her own way. MADGE: I do love your nickname! Clarrie starts to tell Madge about the terrible tantrums that Dorothy used to throw when she was younger, but a horrified Dorothy cuts him off and orders him to serve the soup. Clarrie says that it's rabbit soup and Harold refuses to eat any because he's a vegetarian. CLARRIE: That's alright. So was the bunny! Dorothy says that she did tell Clarrie about this, but he says that it must have slipped his mind, and instead offers Harold "a bread roll or 3". Madge looks very amused by what's going on. 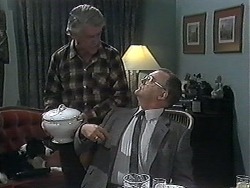 Clarrie also offers Harold a glass of wine, but he explains that he doesn't drink. Dorothy tells Harold to just ignore her father. Madge says that she's glad that she could get together with Dorothy to bury the hatchet, and Clarrie asks if "old Bossy Breeches" has been giving her a hard time. He then starts telling Madge about the time when, as a baby, Dorothy threw her rattle over her cousin's head. CLARRIE: It wasn't one of your celluloid ones either. It was carved out of Tasmanian blackwood. Madge giggles, as Dorothy looks uncomfortable. Kerry and Bev are looking through baby books and magazines. Kerry is amazed by all of the different possibilities when it comes to the birth, but Bev warns her not to get carried away and to talk to her about any ideas she may have before making a decision. She agrees, and goes off into the kitchen to put dinner on. She explains that Joe has been eating like a horse since finishing his fast, while Toby is away for the night. Bev explains that Todd is out too, staying at Josh's. Kerry asks if she wants to stay for dinner, and she accepts, but goes off to call Todd first. Joe and Matt enter, and Joe explains that he's invited him over for dinner. Matt teases Joe for losing their darts game at the pub, but he insists that he can't play without his special darts, which are under the house somewhere. They go off to find them. Bev re-enters, and explains that she's just phoned Josh's and found out that Josh is supposed to be staying the night at Todd's. She can't believe that Todd has lied to her, just when she was beginning to trust him again. She goes off to use the phone again. Paul lets Josh into the room, explaining that it's not the best room at the hotel but it's the only one available tonight. Josh says he thinks it's "fantastic". Paul says it's the least he could do to repay Josh for clearing the virus out of the computer system, but doesn't understand why anyone would want to spend the night alone in a hotel room. Josh says that it's because he's never stayed in a hotel before. Paul tells him that he can order anything he wants from room service, apart from alcohol. He says that Josh can also use the sauna and gym if he wants, but not the restaurant because it's booked out for the night. He leaves, warning Josh to behave himself. No sooner has Paul left, and there's a knock on the door. Cody, Todd and Melissa enter, and they tell Josh that they thought Paul would have heard them laughing as they hid round the corner. JOSH: Welcome to my humble abode. Let's party! Time has passed and the kids are busy juggling fruits. Todd asks if Josh is sure that Paul didn't suspect anything and Josh assures him that he didn't. Suddenly, there's a knock on the door and a shout of "Room service". Todd and Cody quickly hide in the closet, and Melissa goes into the other room. The hotel worker comes in with a trolley of food and expresses surprise that Josh is eating alone. Josh explains that he's "absolutely starving, ravenous". The worker leaves and Josh calls to say the coast is clear. Melissa rushes straight out to take a look at the food, but Josh has to entice Todd and Cody out of the cupboard, where they're busy kissing. The kids finally get stuck in to the food. 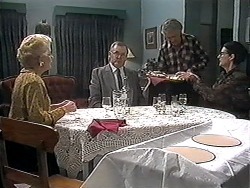 Clarrie passes a plate of food to Madge. She says that she can't manage too much, but Clarrie won't hear of it; she must be dying to eat meat after living with a "lettuce muncher". Dorothy says that she's never been a big fan of meat herself because it lays too heavy on her stomach. CLARRIE: Yeah, nerves always affect her tummy. MADGE: Oh really, is that so? DOROTHY: Considering how seldom he showed up at home, it's a miracle he remembers anything at all. Clarrie offers Harold some spuds and carrots, but Harold refuses to eat anything that's been cooked with meat. Clarrie tells Madge that it must be a pain living with "such a fuss-pot", but Madge insists that Harold is "alright". Madge starts to ask about Clarrie's career as a professor, but Clarrie doesn't respond and asks how long she's been married to Harold. He explains that he got too comfortable with his ex-wife Stella, "like two old slippers". DOROTHY: Madge has heard quite enough about our family for one night. MADGE: Oh, I don't know. CLARRIE: You see, I look into your eyes and I want to tell you everything! HAROLD: Oh, control yourself for heaven's sake! Dorothy orders Harold not to take any notice of Clarrie. Bev re-enters the kitchen and tells Kerry that both Cody and Melissa's parents think that they're spending the night at each other's houses. Bev says that she'll have to skip dinner and go over to see if Helen knows anything; apparently she understands Todd better than her. Joe and Matt come into the kitchen and Joe admits that they couldn't find his lucky darts. Bev says goodbye and leaves. Kerry lays the plates on the dinner table and fills Joe and Matt in on the kids' antics. Joe insists that he didn't behave like that as a kid, and picks up one of the books that Kerry has been reading. He says that he can't believe you can learn how to have a baby from a book, but Kerry insists that it's not that simple and they have lots to organise. She has decided one thing, though; she's going to have a water-birth. Joe and Matt look shocked. Bev knocks on the door and Paul lets her in. She explains that she's here to see Helen but Paul informs her that she's away for the night. She tells him about what the kids have done and Paul laughs, telling her that he knows exactly where Josh is and fills her in on his way of rewarding Josh for getting rid of the computer virus. The kids are pigging out on food. Cody goes off to the bathroom and Todd asks if they should put the TV on, but Josh thinks that's a boring idea for their one night of freedom, and suggests playing cards instead. Todd isn't impressed though. Cody returns and tells them that the bath has an in-built spa and lots of bubble bath, so they rush off into the bathroom. Clarrie returns from the kitchen with flan, asking Harold if he has anything against it. "Not that I'm aware of, no," Harold replies curtly, as Clarrie slams the plate down in front of him. Harold looks very annoyed. Dorothy tells her father that his "rough diamond" act has gone too far now and he's just being plain rude. Clarrie carries on flirting with Madge, saying that they should skip town, go on the road, look at the stars at night and make love by the campfire. She says that he's starting to sound like one of the regulars at the pub, and Clarrie says he can understand why they would make such comments. Dorothy tells her father to behave himself, but Madge says she doesn't mind. HAROLD: Yeah, well I do. I find the whole display extremely objectionable. Well, I'm sorry Madge but I do. CLARRIE: Oh, come on. Where's your sense of humour? DOROTHY: Upsetting others is not in the least bit funny! CLARRIE: Now you sound like your mother. Clarrie tells her that it's just a bit of fun, and Madge agrees, laughing along with Clarrie. DOROTHY: I watched what your bit of fun did to mother all those years. Watched you being selfish, inconsiderate, hurtful. The way you took advantage of her. Believe me, it wasn't funny! CLARRIE: Alright, don't blow a gasket. DOROTHY: I'll do more than that in a minute. 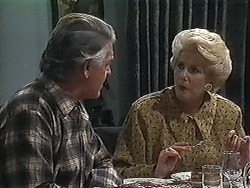 Harold tells Madge that she thinks it's time that they went, but Madge instructs him to sit down as the argument between Dorothy and Clarrie continues. CLARRIE: Look, you've always been argumentative. Too much fat in your liver! DOROTHY [upset]: Stop it, stop criticising me! Stop it, now stop it, dad. I've had enough! CLARRIE: Calm down, girl. Now how about some coffee and a port? Madge tells him that it's a great idea and he goes off into the kitchen. Harold is very angry while Dorothy looks extremely distressed. 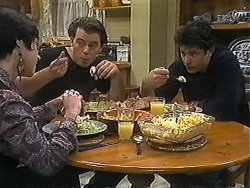 Kerry, Joe and Matt are eating dinner as Kerry explains the water birth idea. Matt asks if she has to visit a centre to use a 'baby bath', but she explains that she only has to hire an inflatable pool. Joe can't believe that she's going to give birth at home, but Kerry insists that it's the "best bit". She explains that when she had Sky, everything seemed sterile and impersonal, and this time she wants to bring a baby into the world in a warm and human environment. She adds that she's glad Joe will be there with her, but he refuses. Kerry insists that it's very important to her, but he complains that she's made all of the decisions without him. Josh, Todd and Melissa are now out of the spa and lounging around the hotel room, as Josh reads out passages from the Bible. There's a knock on the door and Josh goes to answer it, saying that somebody must have the wrong room. He opens the door, and Bev and Paul make their way in. BEV: What's going on here? BEV: I doubt that very much. Cody enters the room and is shocked to see their new visitors. Paul sees the mess that the room is in, with the plates of food all over the floor. He complains about the cost, but Bev cuts him off. Bev demands an explanation, asking what they were doing just now. Clarrie and Madge are now sitting together on the couch. Dorothy asks Madge if she wants any more port, but she declines. Clarrie asks for more but Dorothy refuses to give him any. 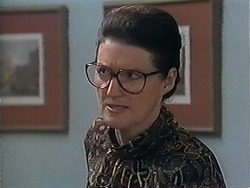 Clarrie asks if Madge is working tomorrow and she says no, so Clarrie comments that it could be their big day to elope. She reminds him that she's already taken. Dorothy tells him to give it a rest, and Clarrie apologises to Madge for the earlier argument, saying that he hopes his daughter's temper won't stand in the way of their friendship. Madge assures him that it won't, and says that her and Harold should be on their way. MADGE: It's time that I was curled up in bed. CLARRIE: Oh, that's a pretty thought. Dorothy apologises to Harold for Clarrie's "abysmal" behaviour, but he assures her that it's not her fault. Madge thanks Clarrie for a lovely evening, and Clarrie says that they should do it again soon. 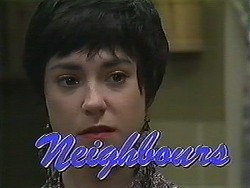 Madge and Harold leave, and Clarrie starts to confront Dorothy about her earlier outburst. CLARRIE: What made you want to go and make a fool of yourself like that, girl? In front of guests! DOROTHY: How dare you treat me like that? This is my house and they are my neighbours. It's all very well for you, you'll be off again as soon as the mood takes you, but I have to live here. I mean, have you any idea how embarrassing that little display was for me? Inventing stories, telling lies about Mother. DOROTHY: No! You listen. One more stunt like that and I'll pack you back to Coopapede so fast your teeth will rattle. Clarrie tries to interrupt, but Dorothy says she doesn't want to hear another word and goes off to bed. Kerry apologises to Joe for making so many plans without him. She admits that she was thoughtless but adds that it means a lot for her to have their baby in a special way. Joe asks Matt what he thinks about the water birth, but Matt refuses to be drawn into it and leaves. Joe tells Kerry that he can't see the point in risking the safety of their child just to be different. Kerry is insulted, saying that Joe is being short-sighted. He insists that having a baby is no time to try out a "gimmick" from a "crackpot book". She defends herself, saying it's more than he's done. Kerry says that she's going to have the baby her way, whether Joe likes it or not. JOE: You do it any flaming way you want. But when the time comes, don't expect me to be there holding your hand! He storms off, saying that he's going to the pub.